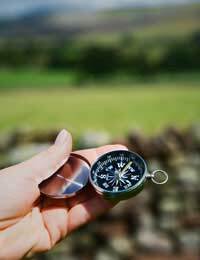 Although orienteering is a sport, one involving using map and compass to navigate an unfamiliar landscape, usually as quickly as possible, learning the rudiments of it is useful for anyone who hikes. That doesn’t mean you have to take part in the events, but understanding orienteering and how to read a map and use a compass properly can be lifesaving skills. If you turn out to have a real knack for it and decide you want a challenge you can always take up orienteering. It might not be something seen on television but it remains an activity with a significant and enthusiastic following. If you’re hiking, the chances are that you’ll be using an OS map, rather than the specialised orienteering maps. The same, principles apply, however, being able to translate what’s on the paper to the vista in front of you. Wherever you go, make sure you have the proper OS map for the area and a good compass – don’t try and save money by buying a cheap one; they rarely work properly. There’s an art to map reading, and it’s one some people never master. You need to develop the ability to visualise the markings of the map and compare them to what you see in order to place yourself. This is why a good compass becomes so important – it allows you to align the map correctly, which is the first step. To learn map reading, it’s worthwhile taking some orienteering training. There are several organisations that offer this, going from the very basics in local parks up to finding your way far out in the countryside. It’s very good practice; once you can handle orienteering, which is really map reading on the fly, you’ll have no trouble doing it at the slower pace of hiking. You’ll have the confidence and will have honed the ability. As a sport, orienteering is demanding. It’s not always on foot – it can take in many different forms of transportation, such as skis or mountain bikes – but do learn on foot. Once you mastered that you’ll be ready for anything. You’re working against the clock in events, with the prize going to the time that has the fastest time. You can also obtain badges for finishing within specified times at different events, both national and regional. Events are held all over the country, and there are many centres and groups that will give an introduction to orienteering. These will all be on foot, and enough to give a real flavour of the sport. From there you can continue if you wish, learning more and eventually competing. You can also take in the basics and just apply them to your hiking. Don’t take map reading lightly. If you go hiking regularly it’s a skill you should learn. There might well be times when all you have are a map and a compass and you need to find your way somewhere. Having the correct equipment and knowing the right way to use it can come in very useful. Over the long haul it’s as important as packing a first aid kit or making sure you have ample water – in other words, vital.